Maria Rioux and costume-maker Debra Fuhrman, owner of Our Coats of Many Colors workshop in Cummings, Kan., stand with children dressed as various saints. BROWNSVILLE, Texas (CNS) — Every October, many look forward to Halloween — the trick-or-treating, the parties and especially the costumes. Some might view these costumes as harmless fun but Halloween costumes, like television programming and other media, form minds, said Father Gregory T. Labus, pastor of St. Joseph Parish in Edinburg and director of the Office of Liturgy and Worship for the Brownsville Diocese. “When it comes to television and other media, people will say, ‘I don’t believe any of that stuff,’ but if you’re watching that stuff regularly, it’s forming you. It is, little by little, making an impression on you and forming your thoughts,” he told The Valley Catholic, diocesan newspaper of Brownsville. “I would say it’s a similar kind of case with costumes, especially with very young minds. Pregnant nuns or whatever, it’s disrespectful and it’s forming an impression that is not good. … Personally, I would say that Christian families should avoid that sort of thing,” Father Labus added. “It was often the case during certain medieval festivals — especially the Feast of Fools — where the lower ranks of society had the opportunity to impersonate the higher clergy (bishops, priests, abbot, archbishop, etc.) for a day,” Grant said. “They would engage in mock rituals, pronunciations, songs, games and all of the rest to poke fun at the established order. 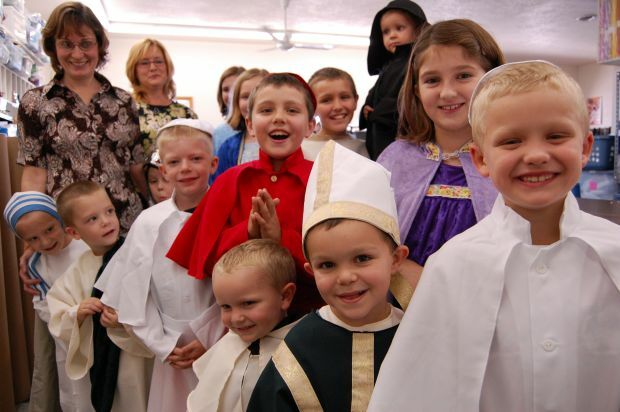 Some churches and Catholic schools, however, do encourage children to dress up as their favorite saint for Halloween or a day later, on All Saints’ Day. This may entail respectfully dressing up as a priest or religious sister but, “usually there is some catechesis that goes with it,” Father Labus pointed out.